I have updated an Easter activity I used as a relief teacher - we had great results and the Prep students loved it. This activity is suitable for Pre K - Grade 2 and can be varied for time management and Grade level. 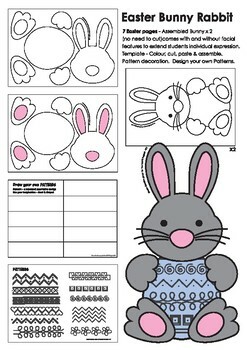 I have also included an example pattern sheet and a page for students to design their own patterns to decorate their Easter Egg. 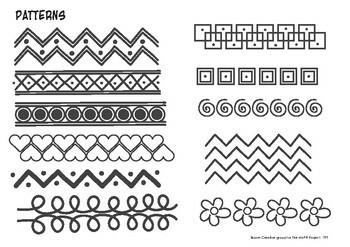 The Pattern sheets are suitable for any project and covers some Art Elements. This file contains 8 sheets including the cover. 2. Easter Bunny - Finished example with patterned egg. 3. 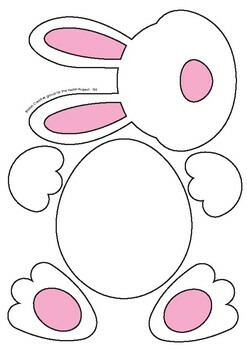 Easter Bunny with features, great for colouring in - early finishers. 4. 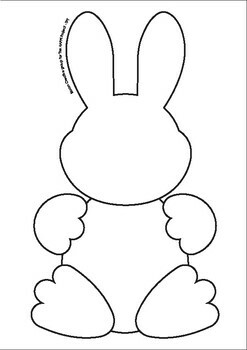 Easter Bunny with no facial features - students can use their creativity to design their own expressions and features. 5. Single page Easter Bunny shapes to cut assemble and paste - pattern the Easter Egg using students own designs, or use those provided. Useful worksheet. 6. Same as no.5 above; including pink detail for colour printing - can be printed B&W. 7. Examples of patterns using line & shape with a description of what a pattern is. Great Easter resource for entire lesson, early finishers, After School Care, Substitute Teacher activity etc. etc. We love to share and would appreciate your ratings and comments as we build our resources to help make your days easier.